"Pink & Blue: Babies Are Due" is a wonderful event that Michelle and I have come up with. It starts December 16th and is a giveaway hop for baby items up to about 6 months of age. We have a wonderful Grand Prize for this giveaway and that is from Combi. 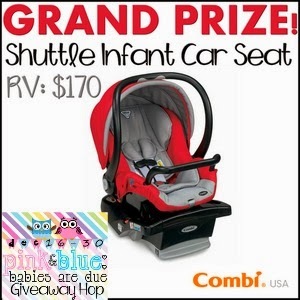 They are giving one lucky winner the chance to win a Shuttle Infant Car Seat in the Color of choice! We received the Shuttle in the gorgeous Teal color! First let me start off by saying that this seat is a bit more green than my pictures indicate. It's a gorgeous teal color. The Combi Shuttle has a wonderful 5 point harness that has nice shoulder pads for comfort on an infant. Each crotch buckle goes in individually which makes it easier to use. Our old infant seat had to be layered over each other and then pushed in at once and it took some getting used to. Chest clip is easy to use as well. Push the button on the right and then pull the 2 pieces apart. Adjusting the harness is a bit different, but is easy. You twist the red lock back there and then lift it up or push it down to adjust the harness strap height to a comfortable level for your child (at or below their shoulders). The head support is also wonderful. This contains the Combi Tru-Safe Side Impact Protection. And this is also with the head rest all the way up. The base has all the information on it that you need. It has a bubble leveler right on it. If your child is under 22 pounds the line should be right in the middle of the bubble at 22 pounds. If your child is between 22 and 35 pounds it would be in the middle of the 35 line. This is easy to achieve by adjusting the base. and then pull out or push in the leveler accordingly. With it in this position it's best for the 22 pound infant or under. The Combi Shuttle also offers the wonderful push button latch connectors. These make it super easy to install in the car. In the car with the latch connected and nice and tight. I need to have the base leveler all the way up in order to get it at that 22 pound mark. PLEASE NOTE THAT WHEN YOUR CHILD IS IN THE CAR THE SEAT HANDLE NEEDS TO BE IN THE UP POSITION. This is different for each car seat, but the Combi requires it UP and in the carry position. I even got a nice tight installation with just the seat belt as well. The Combi Shuttle offers a layer of Energy Absorbing foam which distributes crash forces away from infants head, neck and spine. And in case you were wondering what the bar is? That's an Anti Rebound Bar. In the case of an accident, if the seat tips toward the back of the vehicle, that bar hits the seat of your car and prevents the car seat from tipping further. Also diminishing crash forces. The cover is easy to remove and the entire thing is machine washable. NEVER WASH CAR SEAT STRAPS IN A WASHING MACHINE OR BY HAND. WIPE CLEAN WITH DAMP CLOTH. This car seat is good up to 35 pounds and 33". My son is 22 months and although fits this criteria, he just looks too big in the seat to me. So know that you will get at least a year out of this seat (for most children anyway). It's a very long lasting seat. It comes in 6 different colors and they are all just gorgeous! Price: The Combi Shuttle is right around $170, but to get a year (or more) out of an infant seat makes it worth it.